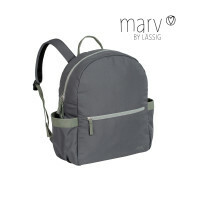 With the Marv Diaper Backpack Mesh Beige, LASSIG offers a compact design for the smaller budget. Product information "Marv Diaper Backpack, Mesh Beige"
description & equipment With the Marv Diaper Backpack, LASSIG is offering a compact design for the smaller budget. This counterpart to the classic bag from the Glam or Vintage collection also includes a water-repellent changing mat and an insulated, removable bottle holder. The backpack also features a water-repellent wet pocket and a stroller attachment. Available in different versions and extra options, each model also comes with a cell phone compartment and key finder. The outer side compartments offer extra storage space and can easily fit a water bottle.